Patsy Matsu Takemoto Mink (Japanese: 竹本まつ; December 6, 1927–September 28, 2002) was an American politician. She was the U.S. Representative for the 1st and 2nd Districts of Hawaii. Mink was born in Paia on the island of Maui in Hawaii. She was the daughter of Japanese American parents. She was a Sansei, which means that she was the granddaughter of people born in Japan who immigrated to the US. She graduated from the University of Hawaii and she earned a law degree from the University of Chicago. ↑ "Biographical Directory of the United States Congress: Mink, Patsy Takemoto, (1927 - 2002)". Retrieved 2011-04-30. 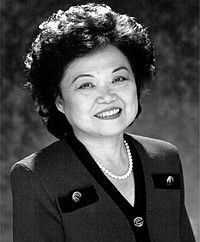 ↑ 2.0 2.1 Biographical Directory of the United States Congress, "Mink, Patsy Takemoto, (1927-2002); retrieved 2012-12-3. ↑ Nomura, Gail M. (1998). " Japanese American Women," in The Reader's Companion to U.S. Women's History (Mankiller, Barbara Smith, ed. ), p. 290. ↑ Kuersten, Ashlyn K. (2003). Women and the Law: Leaders, Cases, and Documents, p. P 54.